As the brothers hit Alice Springs the bets were on who would take out the outright win or would it be a trifecta with all 3 boys on the podium. After doing test runs up at the local MX track both Mitchell and Harrison were happy with their quads thanks to mechanic Adam from Quad Squad. The first step was scrutineering, which the boys breezed thru with their Quads and gear in top condition. Saturdays Prologue saw their brother Jake take 1st place proving he was on target with Mitch and Harrison following in the top 10. All 3 were in the top 50 of bikes, which was a fantastic effort for the quads. Sunday morning saw an early start with sign in and final checks on the quads. It was a hot morning with over 10,000 spectators so the boys were itching to get out there and show them what the quads could do. Mitch was on the 2nd grid of quads to take off the start line and after hitting the whoops at warp speed Mitch managed to get into 3rd position once he reached Finke. Monday was again up and early with the 2 boys left to race home the grueling 246km back to Alice Springs. Mitch took the holeshot off the start line and never looked back. Racing up to speeds of 140km on board his Yamaha over sand, dust and whoops, Mitch came over the finish line a convincing 1st with a 10-minute lead. Harrison on his debut run at the Finke Desert Race did everything on board his Yamaha to make up ground and came in a fantastic overall 3rd. Mitch stated “ My aim was to come and win and everything went to plan. I am absolutely thrilled with my result and I can’t thank our sponsors enough. A lot of people have taken a chance with the quads so I would really like to thank Ray Howard from Yamaha Australia and Kevin Williams from WEM for believing in me and for believing in quad racing”. With out the help of the following sponsors we could not do what we love to do so thank you for your generosity and continual support. 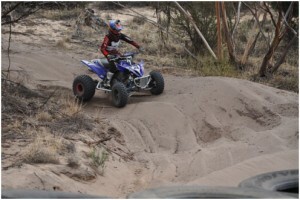 Yamaha Australia, WPS, Hardiman ATV, Quad Squad, Vanika Industries, Reckless Desire Productions, AquaForce, Prestige Personal Training, Gas Imports, B & B Aluminium, Vortex Ignitions, Fox Shoxs, Lone Star, Austraco , Fury Tyres and DWT. 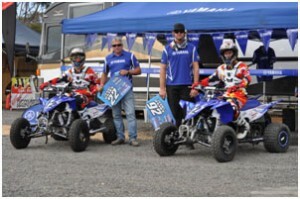 WPS Yamaha ATV Race Team took off to Murray Bridge for the first round of the Pro Quad Championship in the race rig ready to hit the track. On board all 4 brothers, team mates Mitch, Harrison and Cooper along with Jake, motivated and encouraged each other trying to spur each other on with lots of bantering and teasing. On arriving and after walking the well-groomed track it was up to Mitch and Harrison to discuss and prep the quads according to the conditions. Qualifying finished with Mitch in 5th place and Harrison in 10th. With a full grid of quads on the start gates all vying for that elusive hole shot and coming out the other side clean and in front, it was Mitch in great position to take out 4th position in the first moto on board his Yamaha. Not to disgrace himself, teammate Harrison Van Vliet put in a huge effort for his first MX Nationals coming in a very comfortable 8th. Moto 2 proved an absolute duplicate of the first moto giving Mitch overall 4th leaving him a total of 56 championship points with Harrison only 10 points behind and with such tight racing only 4 points difference to get up onto the podium. “I’m pumped with the performance of the Yamaha Quad and am looking forward to training hard in the coming months to improve my level of fitness and skill. I’ve got a secret trainer who is recently coming on board with me and I cant wait to start with her to improve my skill and ability as you can never stop improving.” Mitch commented. Heading off to Thumb Pump 300, commonly known as “The Hardest Australian ATV Desert Race “, it was Mitch Van Vliet giving teammates Harrison and younger brother Cooper all the ins and out for the gruelling up and coming race. Being a previous out right winner, Mitch decided to team up with Harrison leaving Cooper to race the Junior Class. With the Yamahas prepped and ready to roll practice proved just as tough on the body as well as on the quads. With the teams gridded behind the Open Class as well as the Vets class it was left to Mitch to head out on the first leg to try and get past the majority of the field. On competing the first 40km Mitch had a fantastic ride coming in overall 4th giving Harrison a great start. With his head down and bum up Harrison took off only to have a freak hiccup with his quad and get stuck out in the middle of nowhere. Once the officials brought him back in, it was a gutted Harrison who had to leave the rest of the race up to his team mate Mitch. Being 2 laps down meant Mitch not only had to make up time but also had to complete the full 12 laps of the race. 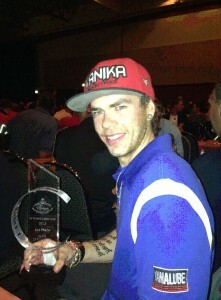 The Yamaha did not miss a beat and Mitch pulled the fastest lap time on day 2 proving he was still in the game. After a gruelling 2 days of hitting the sand, dust, whoops and various obstacles, Mitch clawed his way back up from last to 4th just missing out on a podium finish for the team. Seeing one team member gutted and one riding with amazing skill and agility it was then left to team rider Cooper to get on the podium for the junior class. With high expectations, Cooper on board his Yamaha set off to a flying start only to hit a tree on the first lap. Collecting himself and finally getting his quad out of the tree, Cooper managed to pull in on day one in 3rd position. Cooper, knowing he was in with contention, took to day 2 full of ambition to complete the race and stand on the podium. With the whoops getting bigger and deeper making the 250cc Yamaha disappear from full view in the sand, Cooper stuck to his plan of attack with his teammates cheering him on. After enduring 8 laps of dust, grit and grime Cooper managed to hold onto his 3rd place and stand on top of the podium holding his head high. Well after more than a year away from racing the bug has bitten again and I have done a deal to race a “Tri Series” which consists of three desert races over in West Australia in June, July and August and another 4 hour Enduro up in Broome later in the year. 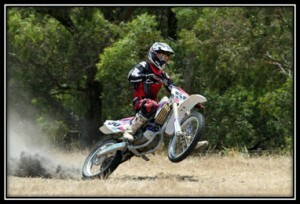 I’m stoked to have been given the opportunity to race again and will be racing under the team Freak Show Racing banner (http://www.facebook.com/pages/Freakshow-Racing/308599881719), these guys are a passionate desert race team based in Perth and will be looking after me for the year. So to get me through the grueling four to five hours of racing over two days in these hot tough events I am happy to say that Aqua force will once again be right behind me, I only use products that are beneficial to me and I can honestly say that drinking this product boost’s my confidence in my body’s performance to another level. In the year away from racing I actually took a break from training as well, not because I got lazy but work commitments and the birth of my new son had my mind on other things. I started my training again in January this year and although the first few weeks were tough it feels really good to be getting back towards the fitness level that I require, I have some good training partners and whether we are out cycling, running or in the gym we are really starting to push each other because everything is a race right??? So there you have it, it’s great to be working with these guys again and I will keep you posted on my adventures. The article Some Like It Hot http://www.theage.com.au/lifestyle/some-like-it-hot-20130211-2e799.html was featured recently in The Saturday Age on 16 February, 2013. It chronicles the experience of Benjamin Lorr, a New York resident who describes his 2-year boom to bust intensive journey with Bikram Yoga. Some articles have a way of creating controversy over their subjects, and it seems this one is no exception. Lorr was overweight and largely inactive and decided to do something about it. He thought yoga would be a good start. With a plethora of different types of yoga to choose from, he unwittingly stumbled across a Bikram Yoga studio as it was the one to his house. Bikram Yoga follows a series of 26 poses developed by founder Bikram Choudhury. It’s a little different to regular yoga those poses are performed in a room that is heated to 40.6 degrees Celsius – a bit hotter than usual for most of us, unless you call the Kimberley or the Pilbara home. Bikram Yoga has been steadily growing in Australia over the last few years and numerous students speak of the enormous health benefits it confers, not least of the weight they have lost from regular commitment to classes, but just like any intensive sport or activity which requires a high degree of skill and challenge, for the inexperienced practitioner a slow escalation of frequency and intensity is vital to preventing injury. In the case of Bikram Yoga, it is also vital to be prepared for lack of acclimatisation to hot environments. So, if you’re planning to get into Bikram Yoga, it’s best to allow your body to acclimatise to the heat in the first couple of weeks and to take it easy in that time. It can take the body up to two weeks to acclimatise to hot environments, so it’s best to allow your body that time to get used to the hot conditions. You will also need to be well hydrated before you start your classes as you could sweat up to a litre or more per hour depending on your own sweat rate. If you don’t replace the fluids you lose in sweat, you could land yourself in a hot nasty place. Even mild to moderate dehydration can have unpleasant side-effects including dizziness, hallucinations, heat rash, severe fatigue and muscle weakness. Even if you’re cramping, it’s a sure sign you’re dehydrated and lacking in electrolytes. A lot of people think that sweat is just plain water, but it contains much more than just water alone – it contains vital electrolytes like Sodium, Potassium, Calcium and Magnesium. The body can generally get these from food during the course of a regular day when intense activity isn’t performed, but, in the hot environment of a Bikram Yoga studio, you need to rely on more than water and the food you eat to replace those lost electrolytes. It’s best to go for an electrolyte formula that matches body chemistry. AquaForce aims to replicate the concentration of the electrolytes you lose in sweat and in the bloodstream, making it rapidly absorbed for immediate uptake by working cells. Having these electrolytes in your system could prevent heat fatigue or more severe forms of heat illness from occurring and it’s wise to drink at least some form of electrolyte beverage before and after your Bikram classes to stay hydrated and to treat and prevent dehydration. 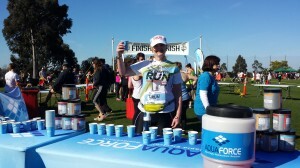 AquaForce has helped lots of people stay hydrated and reduce related fatigue during their Bikram Yoga classses - check out what Elise had to say about how it’s helped her: http://www.aquaforcelife.com.au/the-word-on-the-street/. Take a look at this Bikram Yoga blog for more information on health and nutrition tips: http://bikramyogafitzroy.com.au/blogs.php. Enjoy Bikram Yoga – if you prepare properly and take it slow as you get adjusted to the heat you’re sure to reap its benefits. Everyone needs a hero. The thing is it doesn’t have to be someone famous. In 2010 a promising 19 year old motocross rider had a devastating fall while practicing. He is now confined to a wheelchair as a T4 paraplegic. Did that stop him? Not a chance. As soon as he was able, Harley Quinlan returned to the gym and began rebuilding his body. He had every reason to be angry but instead focused on being the best he could. Harley is now on track to compete in the Paralympics. He has been included in the training squad and has recently competed in Europe in hand cycle events. Harley doesn’t know it but he is my hero. When I don’t feel like getting out of bed or going to the gym I think of his determination, drive and his inability to give up. He is a champion in my eyes already and I will be cheering for him when he gets to the Paralympics! Here are a couple of videos on his recovery that are worth watching.